Alcohol consumption in Australia hits its peak during the festive season in December and January. A survey of over a thousand Aussies found that most people who normally drink once a week increase that to three times a week over the holidays. Half of Aussies in the 20-29 age group admit to binge drinking during the Christmas/New year period. Around a third of all Australians put away more than 10 standard drinks during the festive season. Anyone who doesn’t think Australia has a drinking problem at Christmas-time need only look at Coogee Beach in Sydney. Randwick City Council was forced to ban alcohol from the beach and surrounding park areas for the summer of 2016. Christmas Day revellers left a trail of destruction in their wake – including 15 tonnes of rubbish. There are several reasons why we tend to consume more booze at Christmas. There are more parties and social gatherings to go to, and being on holiday can remove some of the barriers to ‘letting our hair down’ – after all, we don’t have to get up and go to work the next day. Alcoholic is also a popular Christmas gift in this country: even people not known to be big drinkers can end up with a bottle of Baileys, a carton of pear cider, a six-pack of craft beer and 5 bottles of wine in their pile of yuletide gifts. One reason people drink more during the festive season is that it’s not necessarily festive for everyone. We may drink to deal with difficult relatives, to forget about money woes or as a reaction to our relationship issues or loneliness. Drinking at Christmas-time isn’t always about having fun – for some people it’s about self-medication. One of the great myths about drinking is that in some circumstances, it can be ‘healthy’. We keep hearing how drinking red wine (accompanied by some ‘healthy’ dark chocolate) is somehow good for us. Here’s the truth: yes, cocoa is full of flavonoids, which are beneficial antioxidants. But the more processed the chocolate, the less flavonoids are present (plus, chocolate is full of sugar too). As for red wine, its positive publicity stems from the presence of another antioxidant called resveratrol, which is reputed to help reduce bad cholesterol and prevent blood clots. But here’s the thing: wine – with antioxidants or without them – also contains alcohol. And alcohol is neither a natural nor a healthy substance for the human body to be ingesting in any quantity. Too much alcohol weakens the heart muscle and can contribute to liver damage, obesity and high blood pressure, to name just a few of its detrimental health effects. The idea that there’s such a thing as a ‘safe level of drinking’ is a myth. Alcohol is a toxin that kills cells in the human body (that’s why we use it to sterilise needles, for example). In order for your body to get rid of it, it must be metabolised to acetaldehyde – an even more toxic substance. Moral of the story: if you want some healthy antioxidants, get them from blueberries, dark green veggies, salmon, raw nuts, strawberries and other natural foods – not from a bottle of wine. 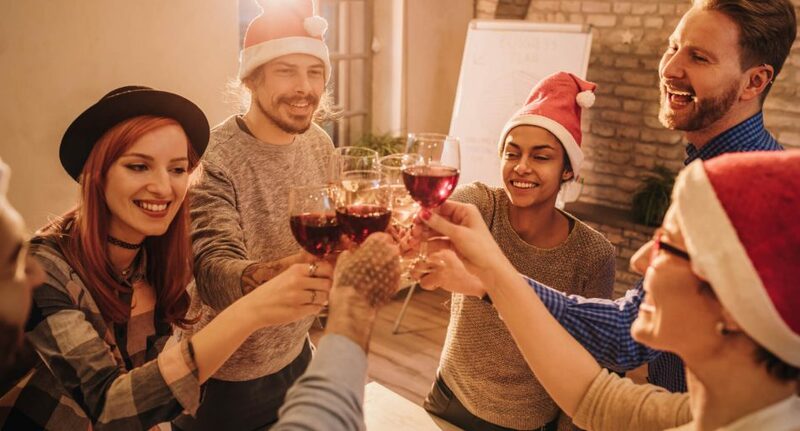 If you choose to drink over the holidays, you’ll reduce your health and injury risks if you confine yourself to no more than one or two drinks in a single day. Keep track of the standard drinks you consume – avoid ‘top-ups’ since it’s harder to monitor how much you’re drinking. Even responsible drinking can send a message to kids that drinking is a necessary part of everyday life, which, for a healthy person, it is not. Show your kids that alcohol consumption doesn’t need to be a part of every social situation, and that you can have tons of fun without it. Drink slowly. Don’t drink on an empty stomach. Know the alcohol content of what you’re drinking and aim for lower-strength beverages. Avoid combining alcohol with energy drinks. Keep an eye on your family and friends so they stay out of harm’s way in an alcohol-fuelled environment. If you’re hosting a party, make sure you have plenty of alternatives to alcohol available. Keep the food coming – it’ll help slow the alcohol absorption in your guests’ stomachs. Make sure your guests get home safely, even if you have to splurge on a taxi or two. Let friends sleep over if it’s the safest option. Have plenty of jugs of ice water around the tables and make it a habit to top up your guests’ water glasses – not their alcohol.